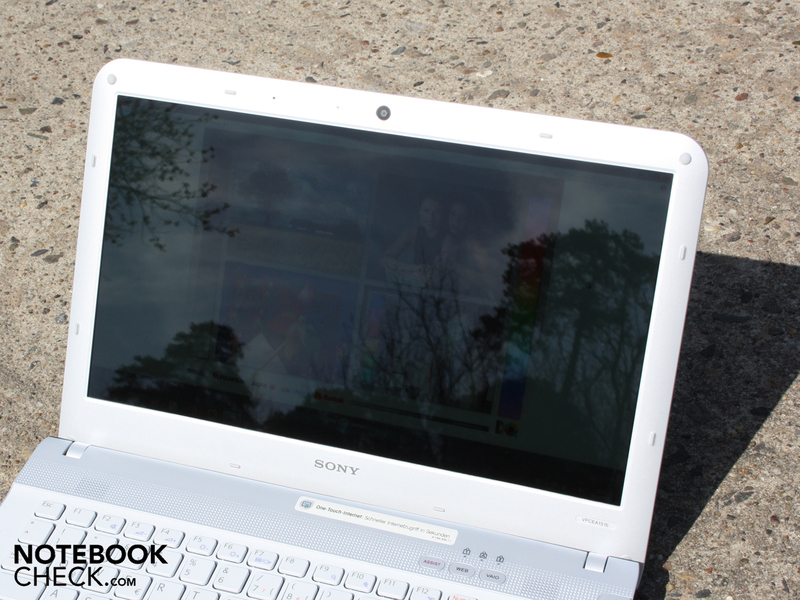 What exactly makes Sony's EA-Series more stylish than other laptops? The 3D-effect finish? How about the glaring colors? Has Sony taken a page from someone else's book with their "Lifestyle" branding? Find out more in our comprehensive test report! You have got to hand it to Sony: when it comes to aesthetics, they have some great ideas. 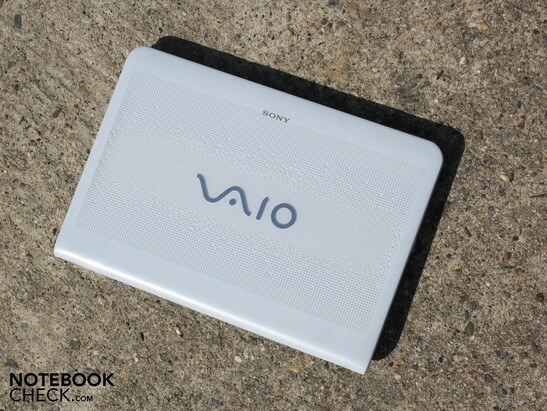 If color and form came together in a device that was well suited to its purpose, such as is the case with the Vaio EA-Series, the ultimate expression of a laptop device would be realized. In this test, we wish to find out whether quality, usability and fashion can come together hand in hand. Even as lifestyle-notebooks occupy a larger segment of the entry-level market, many potential buyers are still skeptical. They ask themselves: how much quality can I expect from an 800-Euro-Vaio? Do the splendid colors belie defects in workmanship? 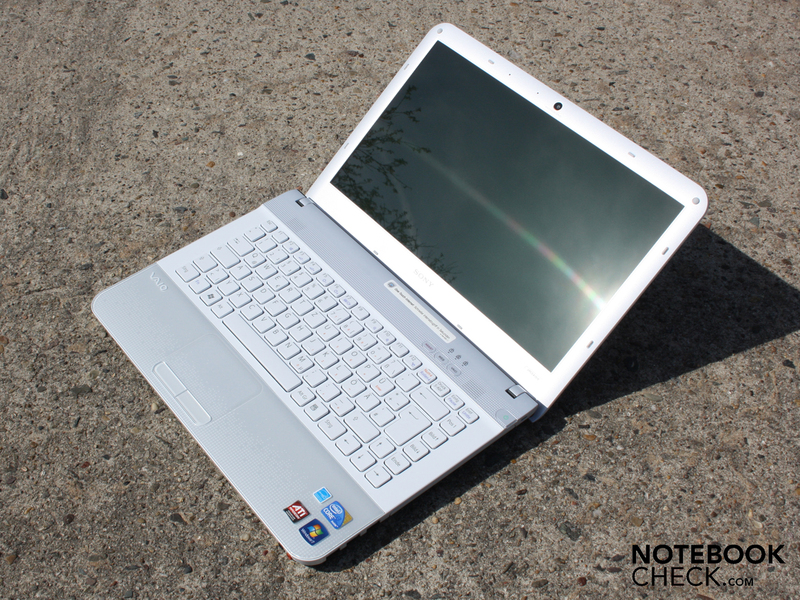 Will the laptop fulfill its purpose as a mobile PC? 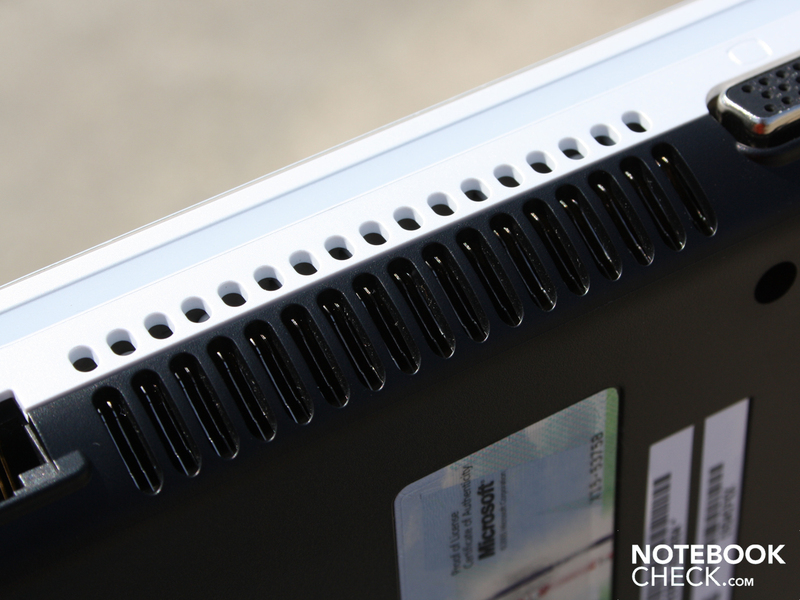 Apart from answering these questions, we won't forget the hardware side of things. After all, what is the utility of a pretty notebook when it has an undersized exhaust fan or when the battery life tops out at 30 minutes? Read on to find out all the need-to-know facts about the Sony Vaio VPC-EA1S1E, which for simplicity's sake we will henceforth call the Vaio EA1. The manufacturer describes the Vaio VPC-EA-Series as "Our most color-intensive Vaio notebook" and there are five colors on offer. White (like our test system), as well as pink and black are currently available at retail, while one will have to wait a short time for the blue and green variants. Sony already has these colors as part of their website lineup. The white variant has, with respect to the design of the outer lid and the palm rest, many similarities with its colorful stablemates. The similarity here extends to only the use of 3D-effects, as the surface pattern itself differs from model to model. While the Vaio VPC-EA1S1E/P in pink has a circular pointed pattern, our white test model with small squares looks a bit more appropriate. The finish creates a sort of shadow-effect, which is particularly evident under sunlight. The pattern on the surface projects its shadows on the underlying layer. The effect is reminiscent of a water-like layer, thin and crystal clear, in which small objects are swimming. The question of pattern and color is however, one of taste. The plastic finish should quell any doubts and is without a doubt, the best in the 800 Euro price class. 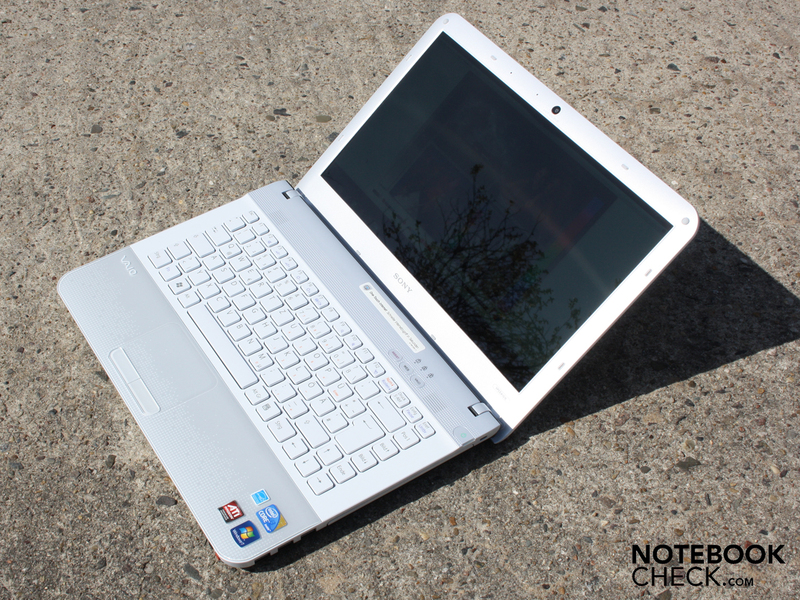 Up until now only Samsung had similarly colorful notebooks/netbooks on the market featuring the same high quality surface coating with the R580 and N220. 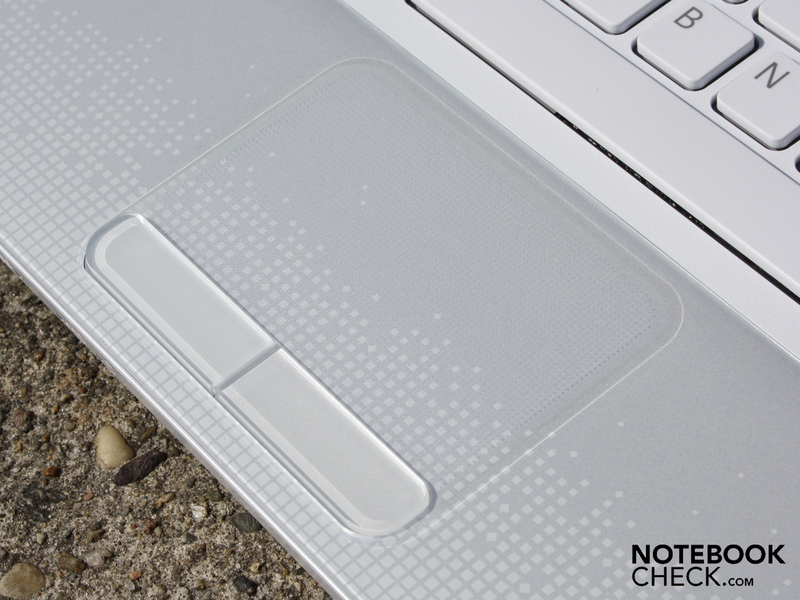 The surface appears very hard and scratch-resistant. 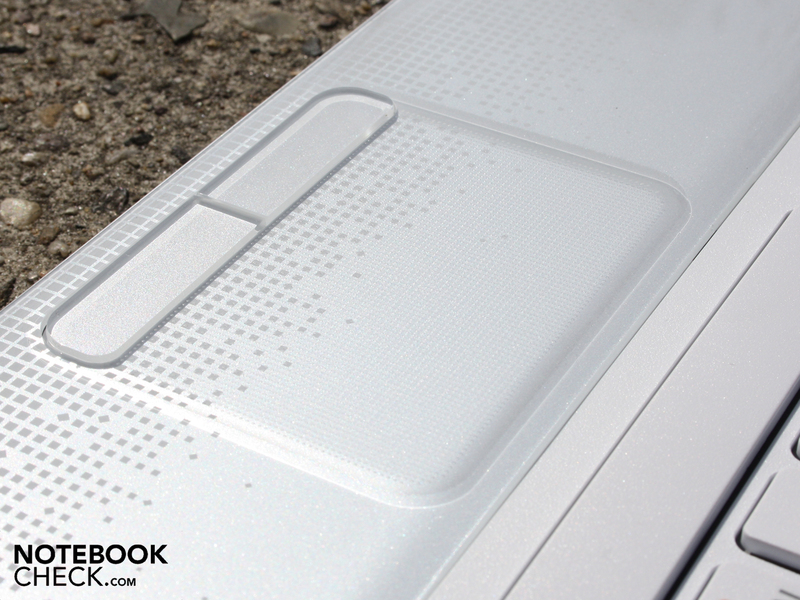 While fingerprints will gladly collect on its surfaces, the white color makes them almost invisible. 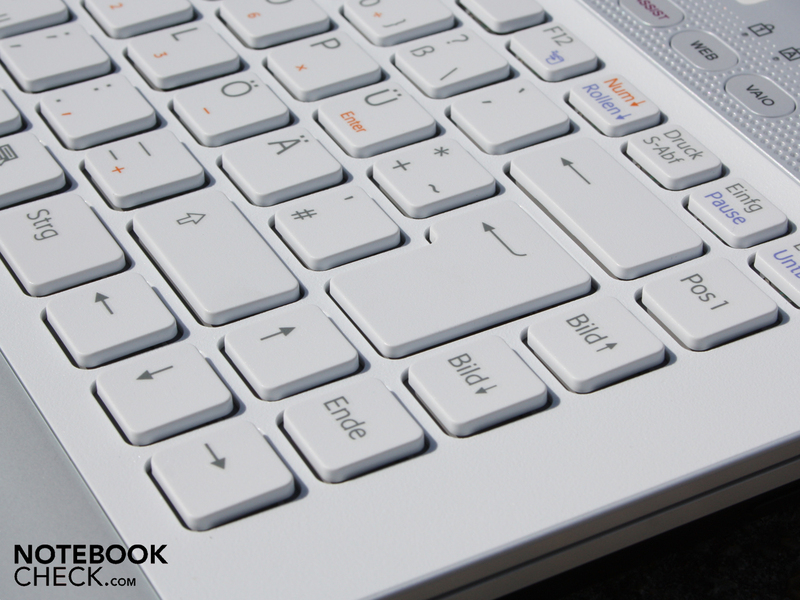 With continual use, the matte-white area around the keyboard will certainly reveal itself to be a weak-point; the slightly glossy plastic will develop dirty edges that will have to be cleaned by the user if the pretty aesthetics are to be maintained. Wiping the area off with a cleanser should not be detrimental for the surface. The palm rest is reassuring with a high level of solidity and is unable to be depressed in any area, which also holds true for the touch pad. 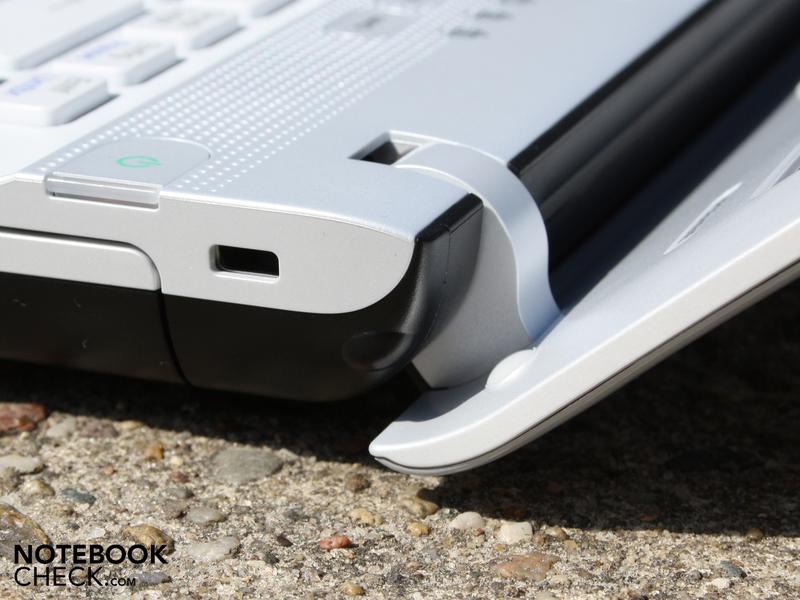 The surface of the base plate and the area above the keyboard are very stable and do not bend at any location. The outer lid is also measurably stiff, though when we grabbed it by its edges we were able to bend it slightly. One thing that we found rather dissatisfying was that the bezel surrounding the TFT-panel was only lightly affixed. Specifically the strip with the Sony logo is able to be lifted up high enough by a fingernail that one could fit a small finger underneath. Both legs of the display hold the outer lid somewhat wobbly in position. Because that allows for a maximum angle of about 135 degrees when open, it isn't particularly a problem. However when open this wide the display has a tendency to teeter. In this position the small legs support the display rather well. also on the palm rest. Regarding connectivity, Sony utilizes the entire length of the right side of the device. The 14.1-incher has a DVD drive though there is only a limited amount of space remaining on the right side of the drive. In this area Sony decided on three consecutive USB ports. With a large space between them, USB sticks or angular plugs would have plenty of space. 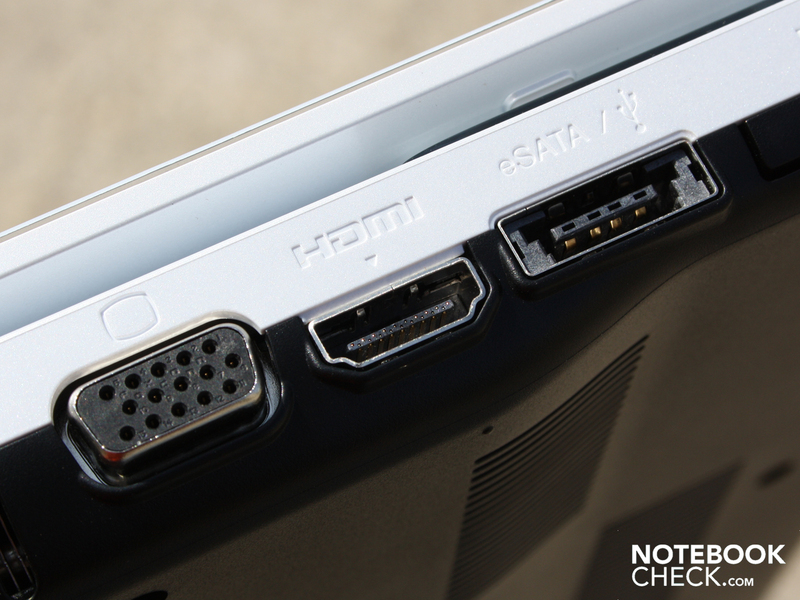 The configuration of the ports seems sensible: VGA direct next to the HDMI on the left side. As such, using a right-handed mouse will not be interrupted by thick cables. Left-handed users have been overlooked here, as the HDMI- VGA- and eSATA ports occupy the area to the left of the palm rest. Naturally, this goes only for when a cable is attached to the device. 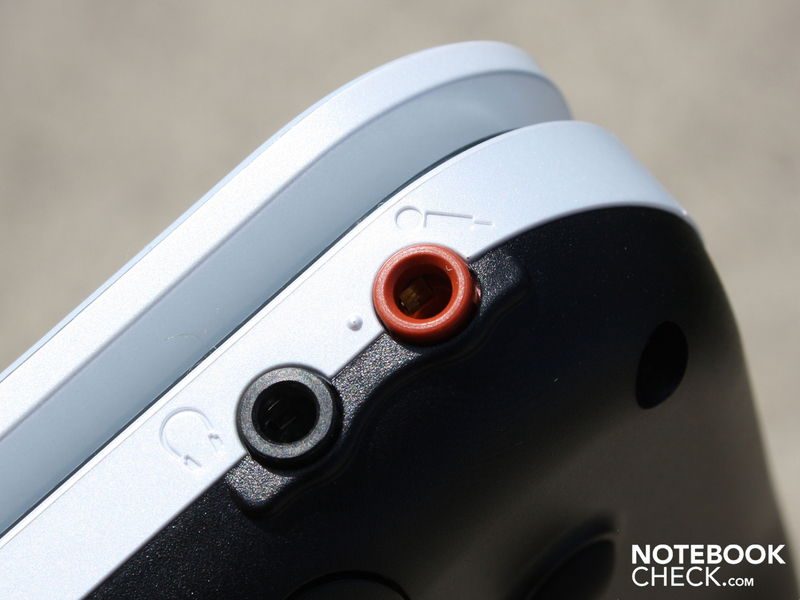 CardReader (SD and HG Duo) as well as the audio ports are to be found on the front side. 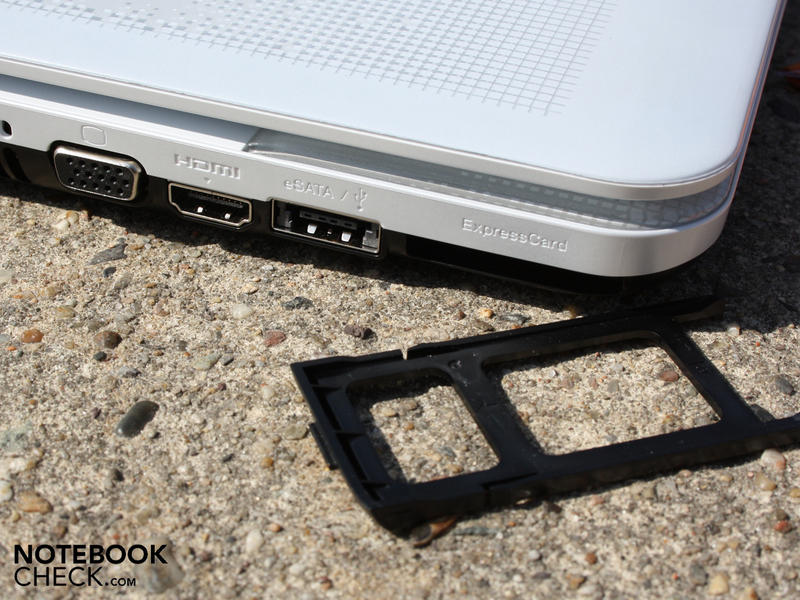 A special feature of Sony-notebooks is the installation of two card reader bays. Connections on the rear would have been more appropriate when using the device at home while at a desk. Thick and clunky cables like VGA, eSATA, DisplayPort and HDMI are best connected there, though a deeply positioned display would have then not been possible with respect to such a design. Sony endowed the Vaio EA1 with a good keyboard. The free-standing keys have a large space between them, which improves accuracy for quick typists or those not looking at the keys. The pressure point and key drop are very distinct. The key response is very firm, a typical feature of many external keyboards and for many typists a mark of overall quality. We would like to point out that the input surface does not conspicuously give way at any point, though abnormal force applied to the area above the optical drive will show some give. 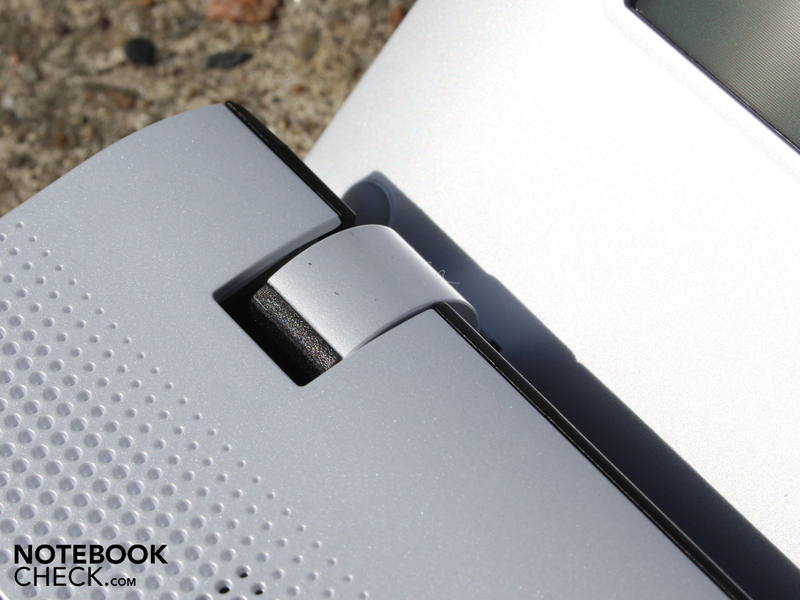 The touchpad is made of the same material as the palm rest. 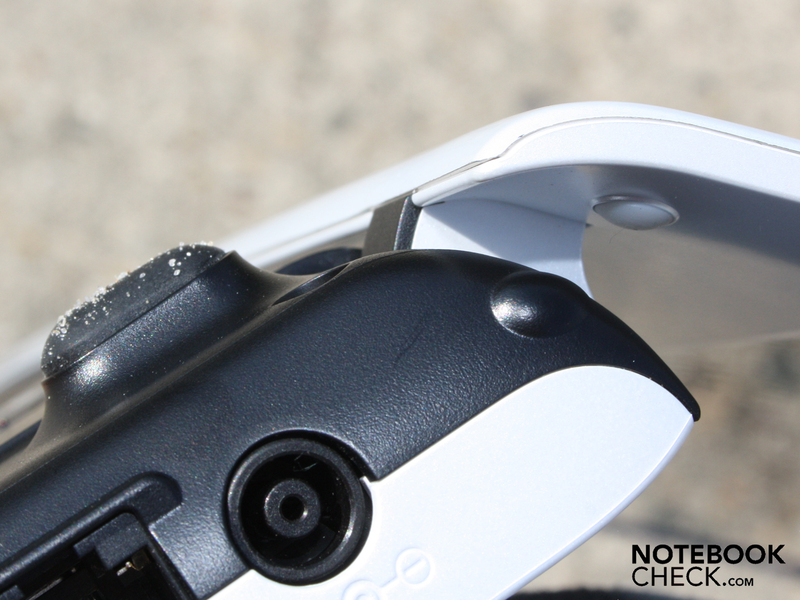 The cursor is precise in its movement when we glide over the slightly pimpled surface of the large pad, which is sensitive all the way to its edges. 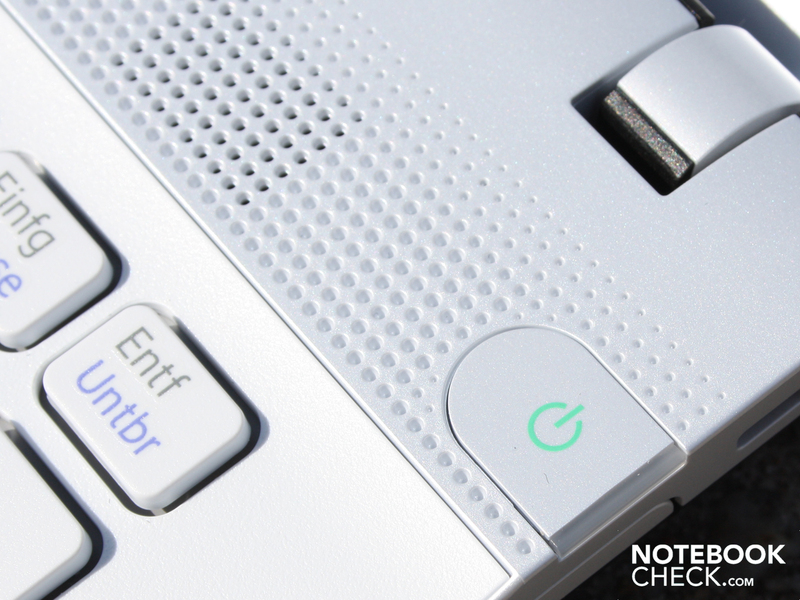 A flat, narrow edge separates the touch-surface from the palm rest and the pad itself , which is not able to be turned off via the Fn-key like in other models. The model used here is a multi-touch Synaptics V7.4. The mouse substitute is recognized by the use of two fingers, with which users can enlarge or shrink a page as well as scroll up and down. The glossy display panel is unable to impress us neither with its contrast levels nor its rather high brightness. 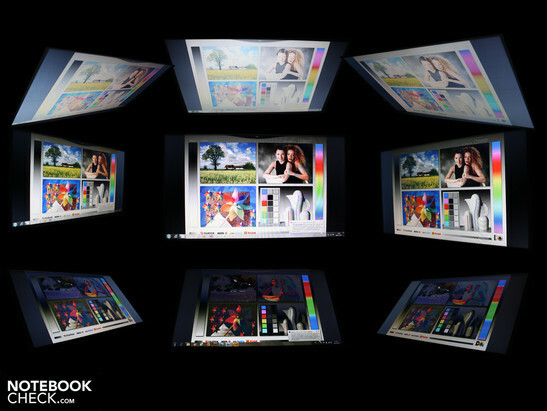 Sony has used a 14.1-inch display (35.5 cm) which has a native resolution of 1600 x 900 pixels (16:9). The WXGA ++ resolution is unusual in mainstream form factors, but suitable for the use as a mobile office companion or entertainer. With black levels of 1.32 cd/m² we were able to achieve a maximum contrast of 158:1. A higher contrast above 400:1, for example, would allow the reproduction of more vibrant colors. Games, films or photos would simply be more handsome looking. With this panel, colors look more pale and weak than lively and fresh. The glare-type panel also serves to mislead some of these colors. On average we measured 203 cd/m². Our testing equipment measures a maximum brightness of 209 cd/m² in the middle of the display. In the face of the glossy panel and the advised mobility, a luminance beyond 230 cd/m² would have been desirable. The display does not favor operation under direct sunlight and users would be advised to seek out a shaded place, especially outdoors. Also, the brightness is not dampened when running on the battery. The 14.1-inch glare-type display is, thanks to its below-average luminance, not a suitable outdoor companion. Adding to this fact is the non-matte display finish. From the front position we can only make out a dark picture and in the presence of scattered sunlight, the problem is only intensified. From various side perspectives, we are not able to recognize any difference in color nor read any text. On account of all this, working in the sunlight is only possible with great effort and frustration. The horizontal viewing angles are acceptable. Up until 30 degrees of deviation from the frontal position are we able to read simple text from the screen. The darkness that was previously lightly-induced slowly increases until 60 degrees when reading is no longer possible. Should the eyes wander to the vertical, the aforementioned script is readable up until 30 degrees deviation. The colors, however, invert themselves noticeably after 15 degrees. Similarly the brightness declines and darkens quickly at shallow angles, which also stands when looking from the vertical. The Core i3-330M (2.13 GHz, 3 MB L2 cache) from Intel is the weakest processor of the newest Arrandale-generation. The i3-330M, like the i5-520M has an integrated graphics unit. 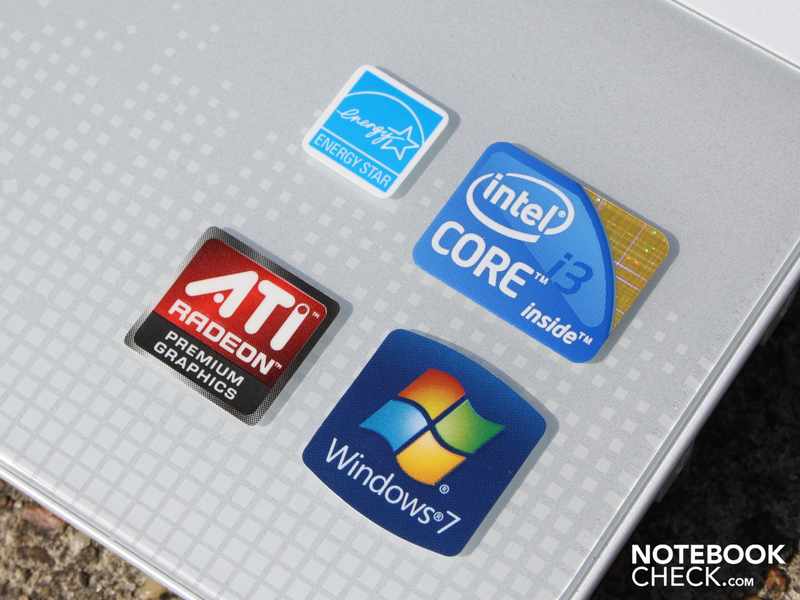 Here the Intel HD is deactivated and a dedicated ATI Mobility Radeon HD5145 (512 MB GDDR3) takes over. Alongside the Core i3 stands 4096 MB DDR3 SDRAM (2 modules) at the ready. An advantageous quality of the i3-330M is Hyper-Threading (HT), which gives each physical processor core an additional virtual core to work with. The dual-core processor has the computing power of four cores at its disposal. Whether HT is available can be quickly checked in Windows Task Manager under the performance tab (CPU usage). The difference between the i3-330M and the Core i5/i7 is that the Core i3 does not have the Turbo-Boost feature, which allows each core to be dynamically overclocked depending on system requirements. Entry-level graphics from ATI and the smallest i3-CPU. The PCMark Vantage recorded a score of 5082. This value approximates the application performance of a notebook. All components, such as the CPU, GPU, HDD and RAM will undergo synthetic testing. With such a score the 14.1-incher finds itself at about the same level as the 15.6-inch Toshiba Satellite L550-207 (4956 points) with the same i3 processor. The graphics card is not a deciding factor in a PCMark Vantage test. Laptops with a stronger dedicated GPU don't necessarily have a better overall system performance. 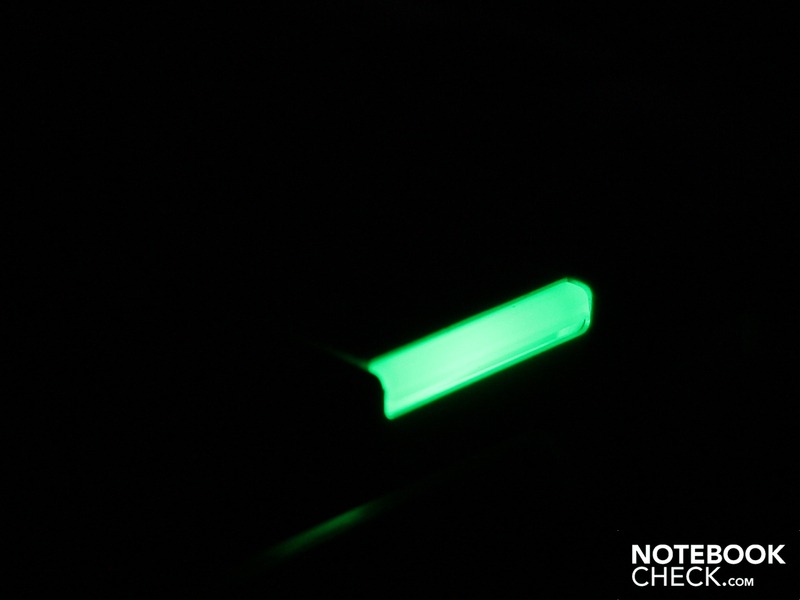 For instance, the Acer Aspire 8942G-334G64Mn (ATI HD5650) scored 4755 points. A look at the Core i5 processor 520M in stronger-performing systems shows a large difference. A Dell Studio 1558 achieves 5929 points, while a Samsung R580-JS03DE puts up 6026 points. The reason for this large performance gap is the Turbo Boost feature of the i5/i7 processors as well as their generally higher operating frequencies. We found some conspicuous latencies with the DPC Latency Checker when turning the WLAN-module on and off. Such a problem deals with time delays in Windows that can disrupt real-time applications. A disruption to real-time-audio would be one example. 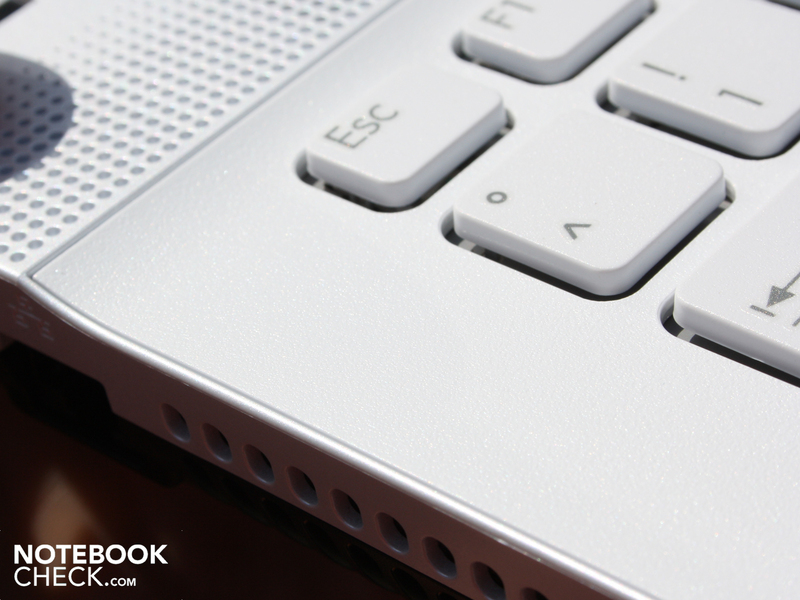 The Vaio EA1 has a fast 5,400 RPM hard drive from Seagate on board. The 500 GByte HDD (ST9500325AS) reads 62.3 MByte/s in the sequential read test, which is an average value. The HDD is only quietly audible while in operation, but is not louder than the normal sound level. The ATI Mobility Radeon HD 5145 graphics card belongs to the entry-level category and can utilize up to 512 MB GDDR3 of video memory. The memory is clocked at 800 MHz, the core at 720 MHz. The GPU is only capable of DirectX-10.1 effects, as the part is simply a renamed Mobility Radeon HD4570 with higher frequencies. Sony does not use the all of the available overclocking room (900 MHz) leaving the memory at 800 Mhz. The gaming performance of the mainstream GPU is markedly weaker than the ATI HD 5650 and Nvidia GT 330M. For the majority of current games, it simply isn't strong enough. 3DMark06 displays a weak score of 3651 points when it comes to 3D competency. We will carry out a total of three game-tests. The real-time strategy game is multi-core capable and profits from Hyper-Treading. However, combined with the weak HD 5145, there is little to gain from all of this. World in Conflict is playable at medium resolutions (no DirectX-10 effects) but only at 1024x x 768 pixels. At high detail the frame rate breaks down to 18 frames per second. In comparison, a Dell Studio 1749 with an i520M and an ATI HD 5650 is able to render the game on high settings at a playable 33 FPS. The shooter is already somewhat older and presents little challenge to the hardware. At 1024 x 768 pixels and with the level of detail set to high the shooter runs at 51 FPS. This leaves room to raise the resolution to 1280 x 900 pixels. The sequel, Left4Dead2, is not as forgiving in this respect. The fantasy-adventure Risen overcomes the HD 5145 only at the lowest settings. 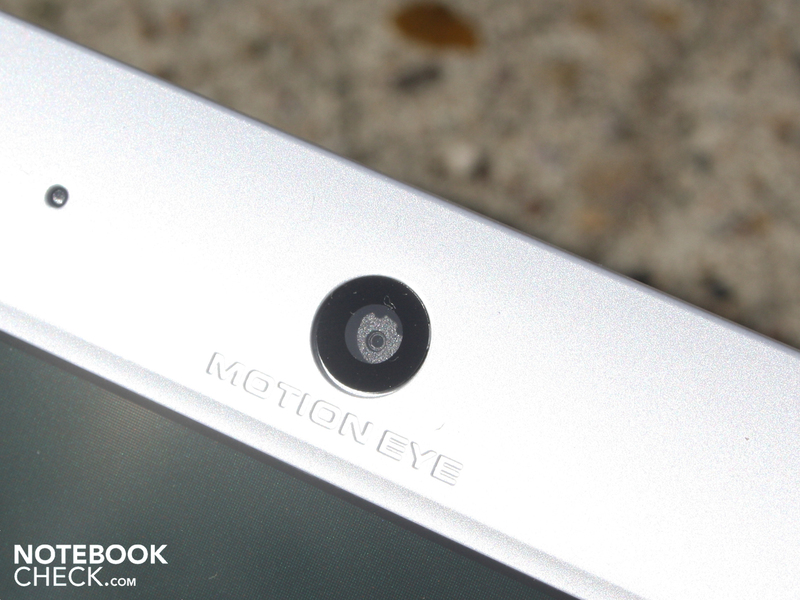 At 800 x 600 pixels and low detail, 74 FPS are to be had. At middle settings (1024 x 768, middle, 2xAF) the Vaio EA1 puts out 20 FPS. At this rate the game is not playable. Conclusion: With the ATI HD5145, mobile gamers should leave their fingers at rest. Current and above all demanding games are unable to be brought to life by the GPU. For older games, a la Left4Dead the performance is adequate. Those interested can head over to our graphics-card comparison and look at the exact specs of the ATI HD 4570 in detail. This part is the same as the HD 5145 under a different name. 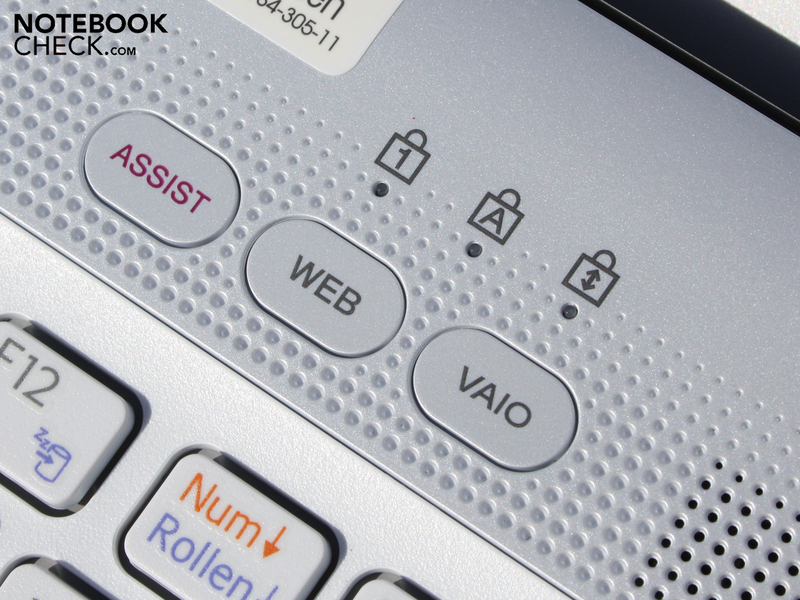 The Vaio EA1 is always audible, even when not being taxed by the user. We measure 33 dB(A) at idle, that is to say that the processor and graphics card are not under any load. When surfing, writing emails or listening to music the system fan turns at its lowest setting without pause. Active cooling here does not turn off, not even periodically. When gaming or when the user is taxing the processor in a CPU-Benchmark the cooling system turns up: we measure 41.3 dB(A). 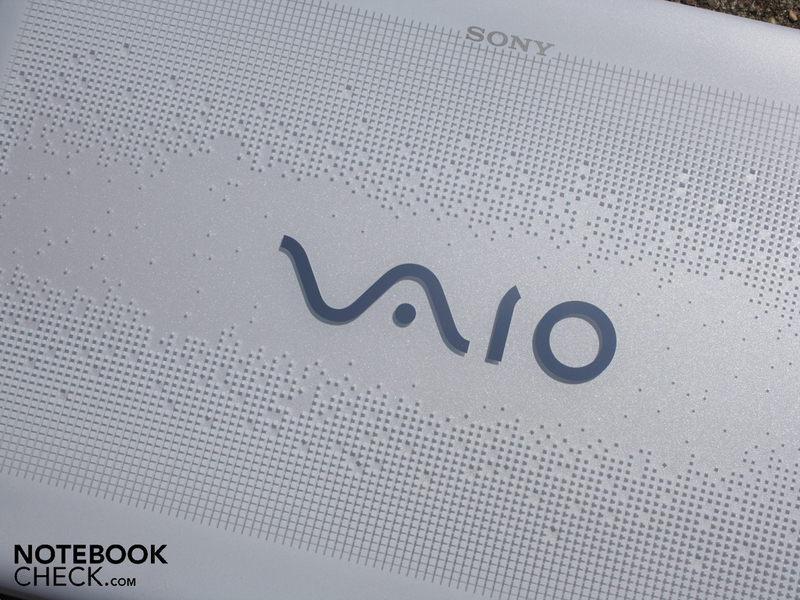 The Vaio EA1's fan unfortunately does not remain constant here, rocking back and forth from 40.7 to 41.3 dB(A). Such a stress test brings the cooling system to its knees, turning at 43.4 dB(A) whilst never remaining at a consistent RPM. At idle the average temperature at the underside of the device lies around 25 degrees Celsius and the area around the palm rest also stays comfortably cool at 24 degrees Celsius. The exhaust heat under stress increases measurably and during a Furmark/Prime95 stress test the fan is working its hardest. This increases the temperature of the underside sporadically to about 48 degrees Celsius. This measurement is only for the immediate are around the exhaust vent and the work area remains within acceptable levels when the machine is under stress. The touchpad measures 34 degrees Celsius at this point. During a stress test the Vaio EA1 measures 74 degrees Celsius at the processor, according to internal temperature sensors. Thermally concerned users have nothing to worry about here, as the 14-incher will neither burn down nor shut off during periods of extended stress. (+) The maximum temperature on the upper side is 36.1 °C / 97 F, compared to the average of 36.5 °C / 98 F, ranging from 21.1 to 71 °C for the class Multimedia. (+) In idle usage, the average temperature for the upper side is 21.8 °C / 71 F, compared to the device average of 30.9 °C / 88 F.
The stereo loudspeakers located over the keys deliver a high-toned sound image. Bass and volume are completely lacking here, while a foray into various configuration options in the Dolby Audio Enhancer menu brings minimal improvement. As such, listening to your favorite music likely isn't what you want to be doing. The volume, at its highest setting, is also comparably low but this wouldn't be a problem because users wouldn't turn it up that high anyways: at such volumes, the speaker membranes vibrate and clatter. The connection of external loudspeakers over a 3.5 millimeter cable helps to a great extent. 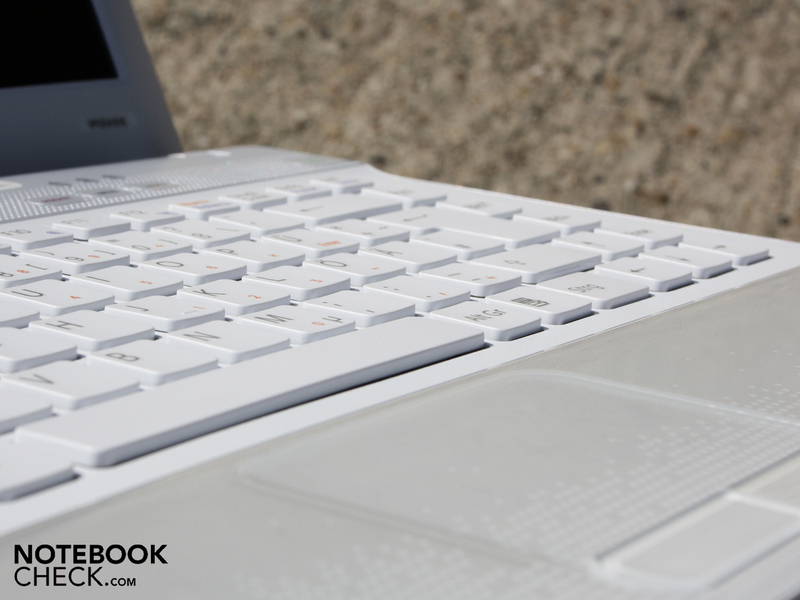 The external volume control of the notebook is controlled up or down with ease. Even at lower volumes, signal noise is never an issue and the sound is clean coming through the speakers. 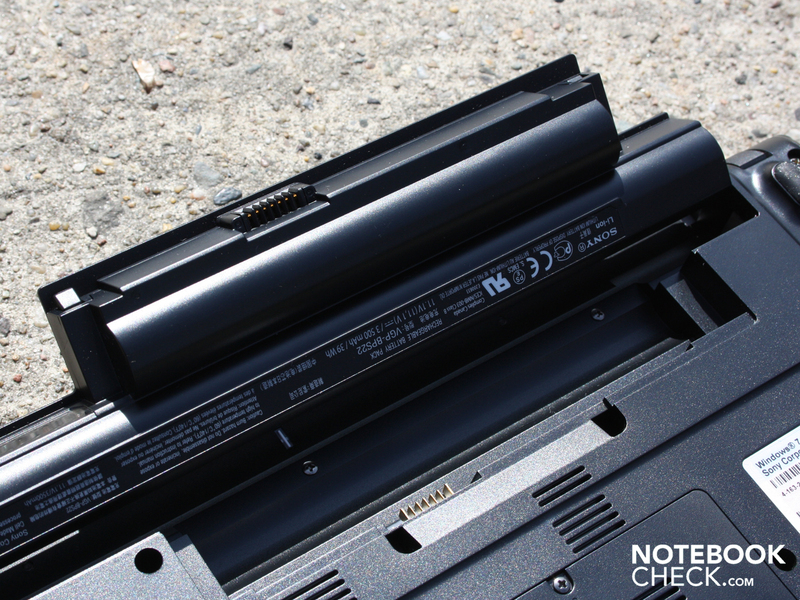 Despite the low electrical consumption of the system, the battery life is unfortunately not one of the better qualities of the Vaio EA1. This does not come as much of a surprise due to the weak 3500 mAh battery. 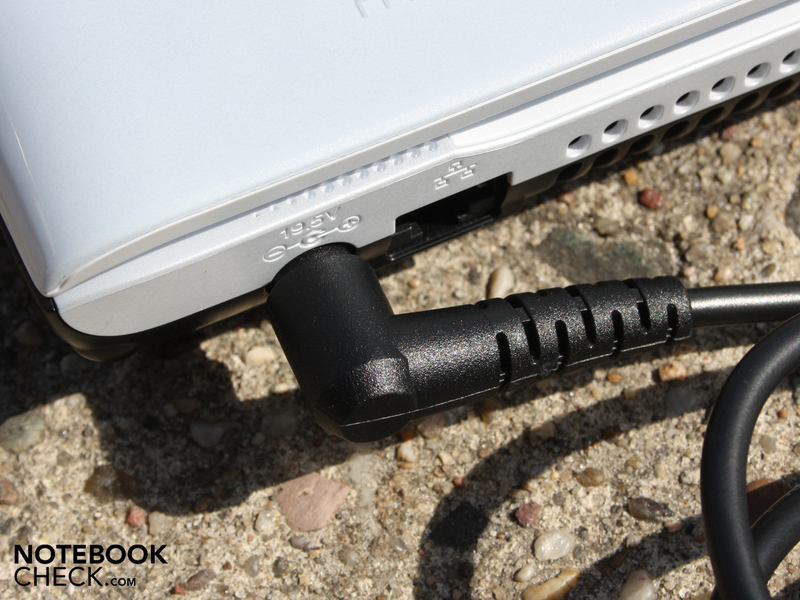 Even netbooks today have markedly larger battery capacities (i.e. 5200 mAh). After a paltry two and a half hours surfing via WLAN the battery is empty, which amounts to a total of 149 minutes. During this test we visited various news portals and downloaded a file from Steam. The LED-panel ran at about 150 cd/m² during this time. How long could users hope to watch a DVD film for? Our copy of Lord of the Rings ended after two hours (125 minutes). 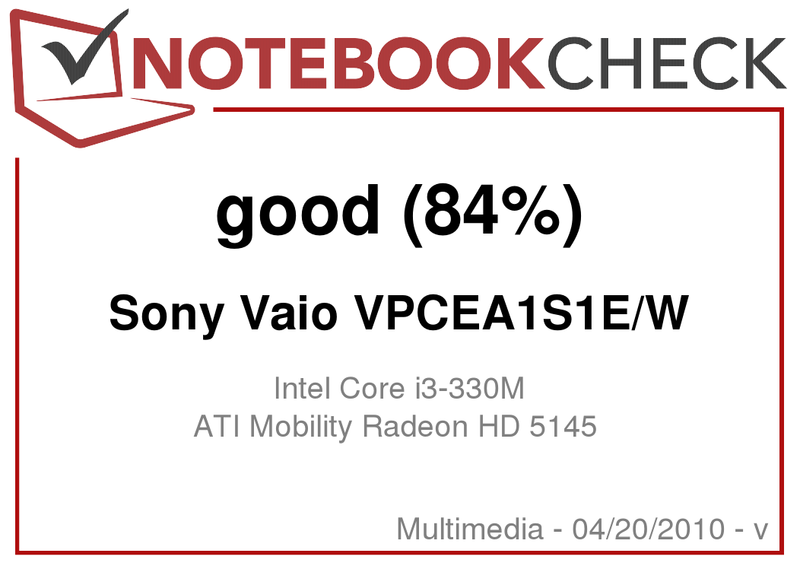 Those putting the Vaio EA1 to work without stressing the CPU and GPU to their fullest extent should have about four hours at their disposal (BatteryEater Classic-Test). The maximum battery life at idle is a longer four hours. This is however an unrealistic figure because the CPU is doing absolutely nothing while the display dims itself to its lowest possible brightness and WLAN/Bluetooth would have to be turned off. While battery life would be the longest possible, productivity would also have to be at an all-time low. The idle electricity consumption of a typical 14-incher with conventional mobile technology has, for the past few months, stayed around 25 watts (not ULV or CULV). Intel's newest processors with the names Core i3, i5 and i7 have pushed this relationship more in favor of the energy-saving crowd. 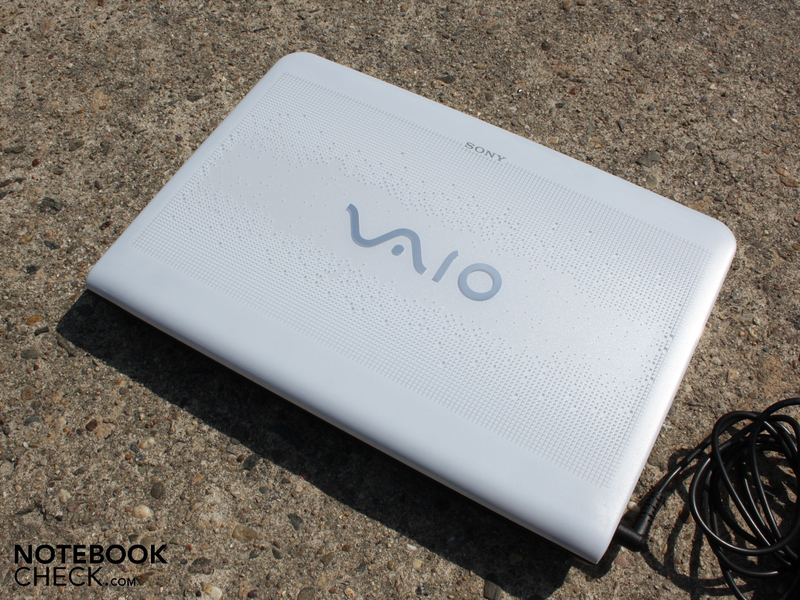 The minimal idle electrical consumption of our Vaio EA1 is only 12.2 Watts. At maximal display brightness and wireless module activated the figure jumps to 17.9 watts at the socket. Under modest operation, for example surfing the web, on average about 25 Watts are realistic. When the HD 5145 is busy with a 3DMark2006 benchmark, this number jumps to 56.7 Watts. The maximum consumption during a Prime95 / Furmark stress test was 65.3 Watts at the multimeter (without charging the battery). 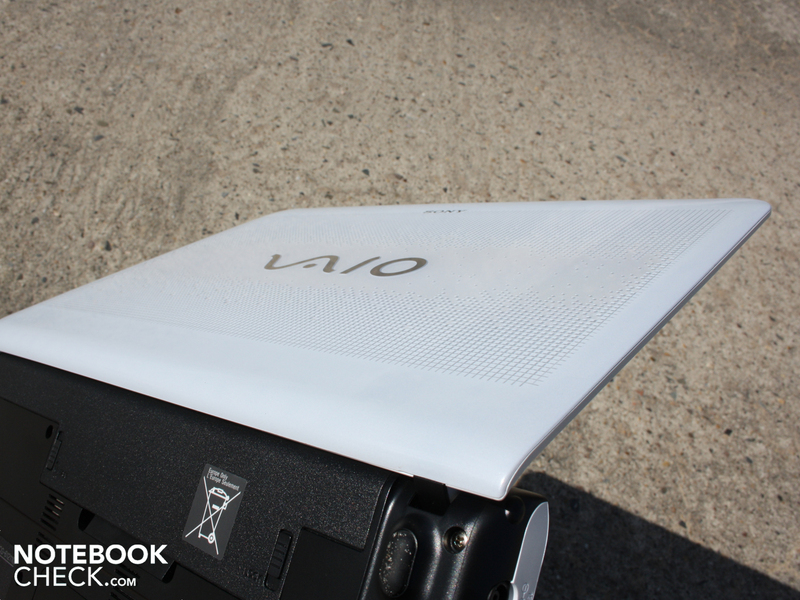 The 14.1-inch Sony Vaio VPC-EA1S1E breaks the mold--and that was its intention all along. 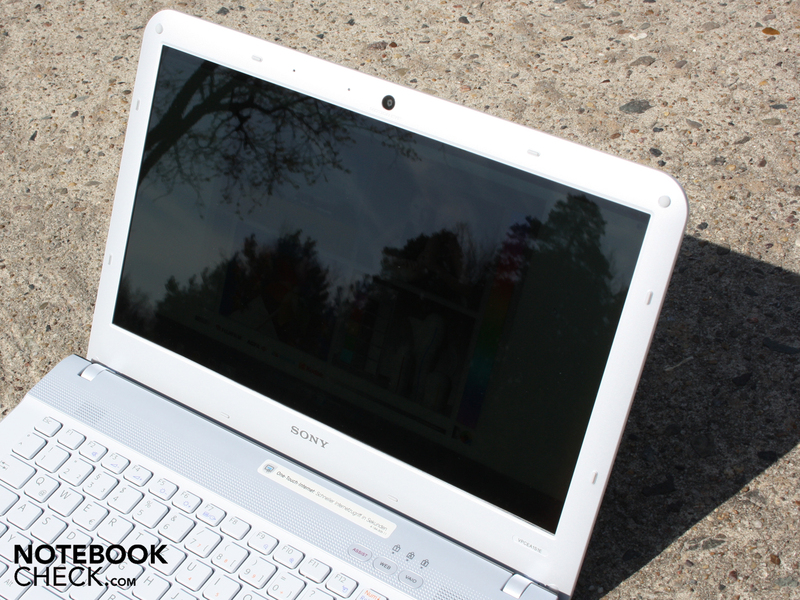 Sony wanted to create a colorful and handy notebook series for its inexpensive entry-level segment, the result of which is clear. 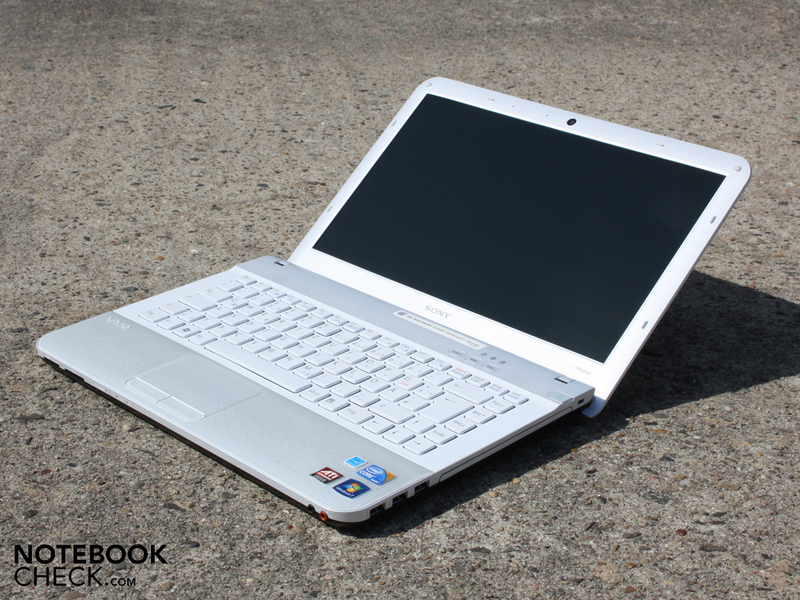 The Vaio EA1 with a Core i3-330M (2.13 Ghz) is technically an office-all rounder with comparably high performance. The processor has, generally speaking, stronger performance as its Core 2 Duo predecessor with similar or higher speeds. Multi-core applications show a defined benefit here. The entry level GPU ATI Mobility Radeon HD 5145 is only suitable for current games in certain circumstances. The lifestyle-notebook counts its advantages less in the technical sense and more concerning aesthetics, haptics and workmanship. The premium finish on the palm rest and outer lid look good and are at the same time very stable. 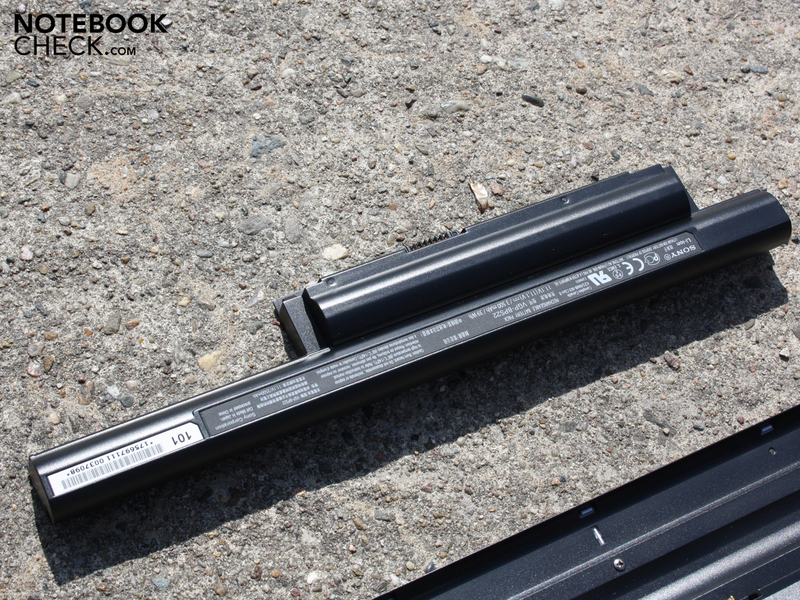 The chassis, with its enclosed battery lies well in the hand and is not able to be bent or dented anywhere. With all the high praise, we shouldn't let the weak points get overlooked: the hinges of the outer lid are strongly sprung and the display bezel is not firmly attached to its surface. The display is not particularly bright and contrast-strong, but thanks to the high 1600 x 900 pixel resolution users profit from a good view of the display. The mobility of the 14.1-incher is rather weak. Two and a half hours when surfing via WLAN are no longer acceptable in the era of Intels CULV-processors and 9-hour netbooks. 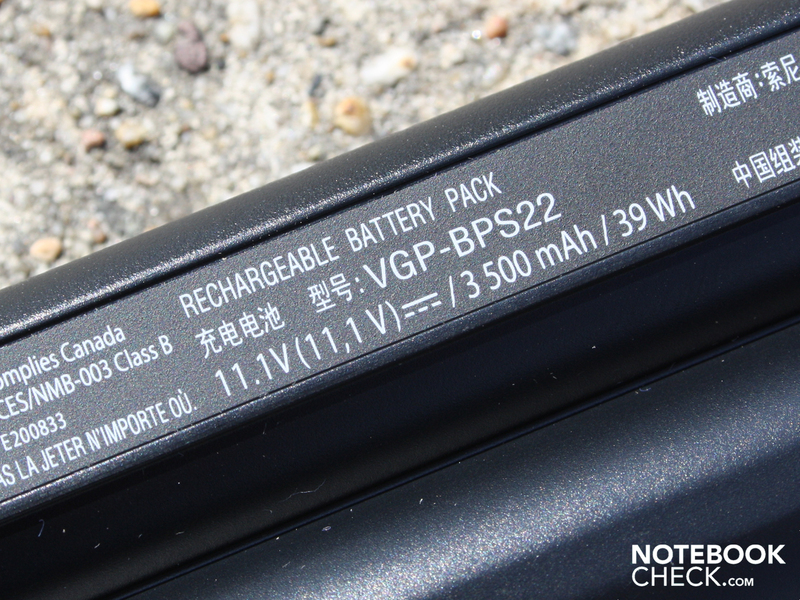 The manufacturer apologized itself for this oversight, as the Vaio EA1 has a low capacity of 3500 mAh. 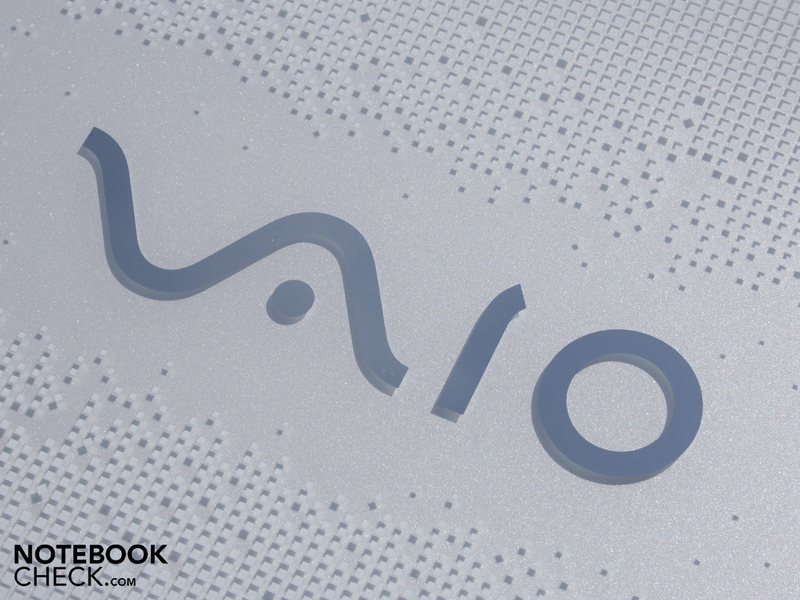 Those not looking for 3D-performance and high mobility will be happy to know that the Vaio EA1 for 800 Euro is a pretty notebook with attactive aesthetic details. Those not looking for individuality would find, for example, the Acer Aspire 5741G-334G50Mn with the same hardware and a 15.6-inch screen available for 650 Euro. 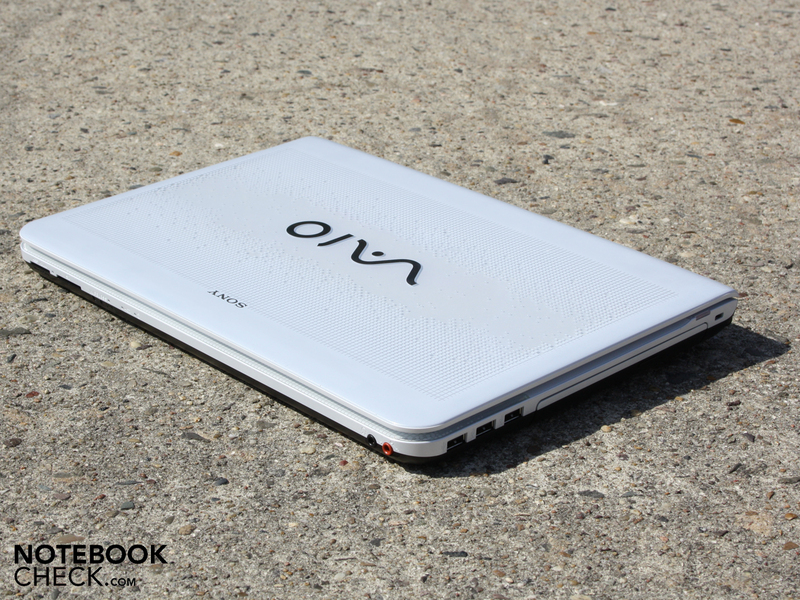 The 14.1-inch Vaio EA1S1E is available in a chic white as well as a bright neon-green or cosmic black. 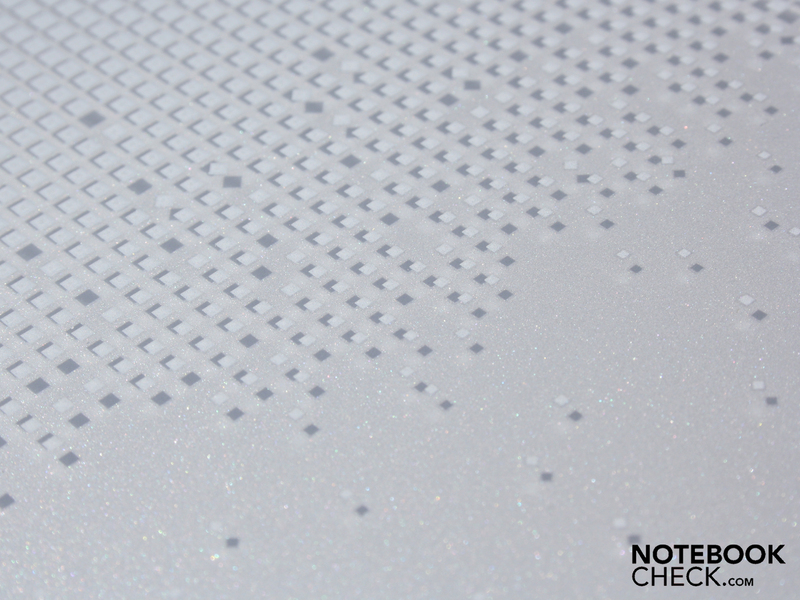 The touchpad is covered with small bumps, and fingers have to overcome much friction when gliding across them. Depending on taste, this could be an advantage. 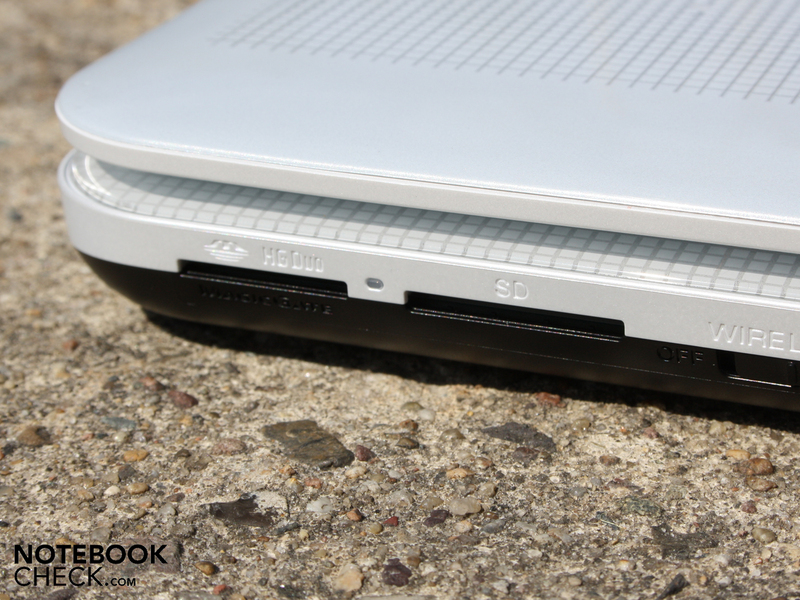 For a 14.1-incher the Vaio EA1S1 is decorated with various ports. The picture shows the two card readers. For fast external hard drives there is an eSATA port. 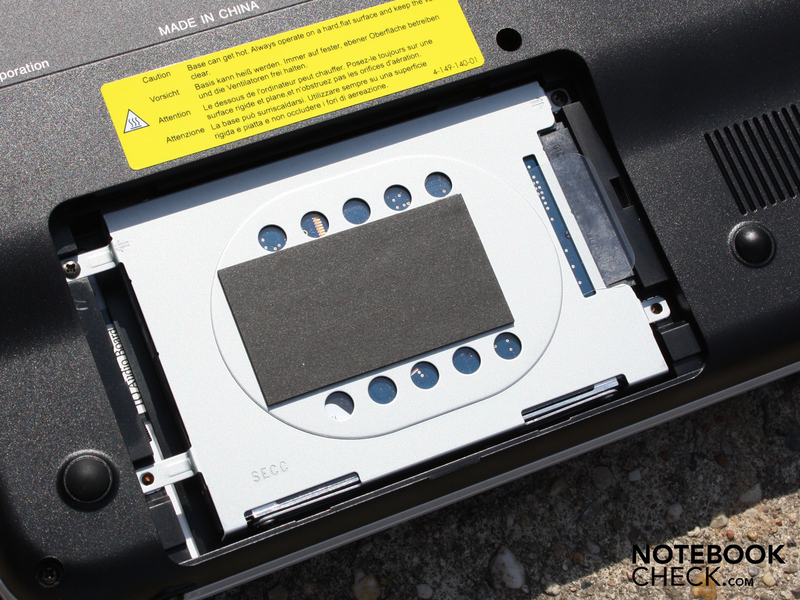 Enhancements made possible via the ExpressCard34 slot. The lid opens to about 140 degrees. the bottom edge of the lid doesn't touch the ground. 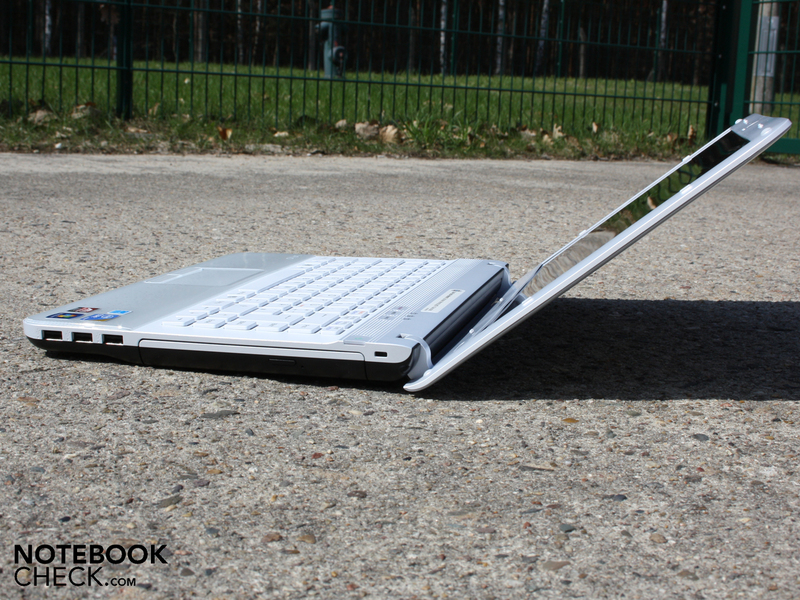 Its surface is relatively sturdy. Strong pressure doesn't create any depressions on the front side. 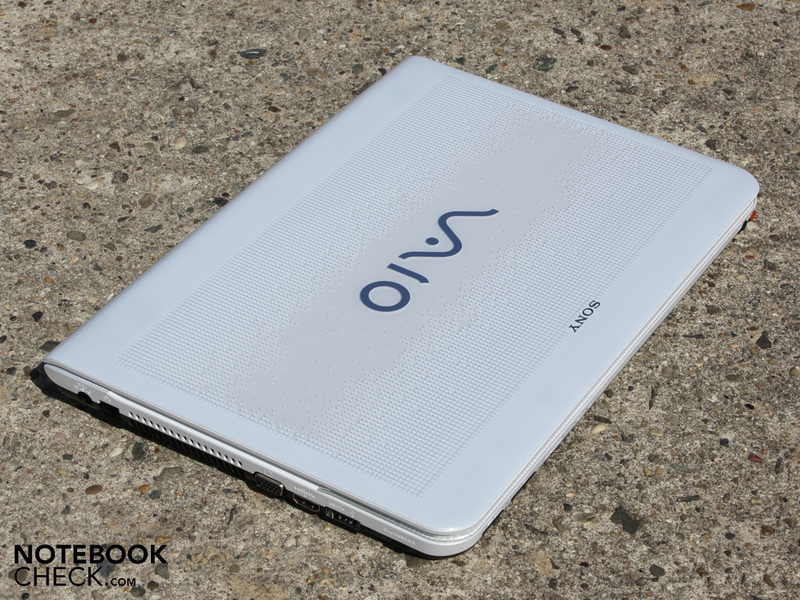 Mobility certainly isn't the Vaio's first name. 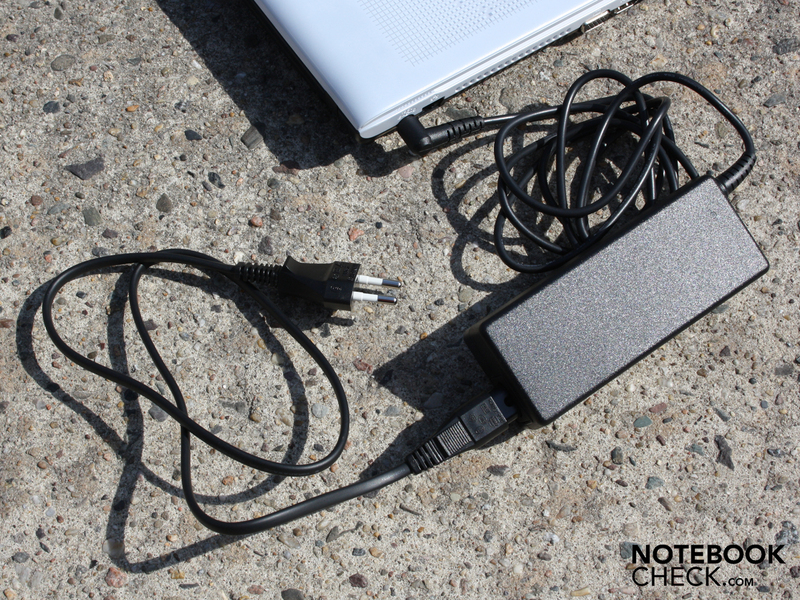 The AC adapter should always be present, since after a maximum of 2.5 hours the battery is out of juice. The battery doesn't wobble in the case. It is brought out by turning a small mechanism and sits very safely in place. and the 2.5 inch SATA hard drive. The keys have a firm feedback but a rather unclear action. This has a matte finish and is susceptible to getting dirty. We decided on the white model. even the surface of the outer lid is comparably solid and hard. Lid as well as palm rest display a spatial effect. Similarly the shadowed pattern can be found by the stickers. The decklid pattern projects its fine-pointed shadows to the layers below. Those looking for aesthetics can ask for it by name. Lights up green when running, orange when in standby. and lies in a white recess. This model has a 500GB Seagate built in. The all-together stable, though not perfect, workmanship will make others covetous. Sony has achieved a very interesting look. A bit more restraint on the part of the cooling fan due to the comparably low system performance. Those looking for extravagance through good quality will be satisfied by the EA-series. Though the same hardware is available from Acer at a lower price, the quality of the surfaces here are a convincing argument. 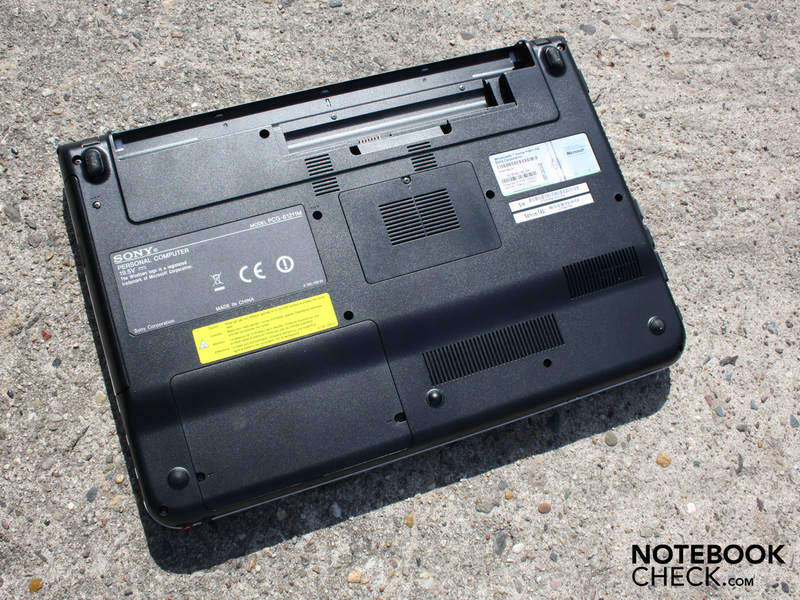 The same hardware with better battery life for 650 Euro: Acer Aspire 5741G-334G50Mn. 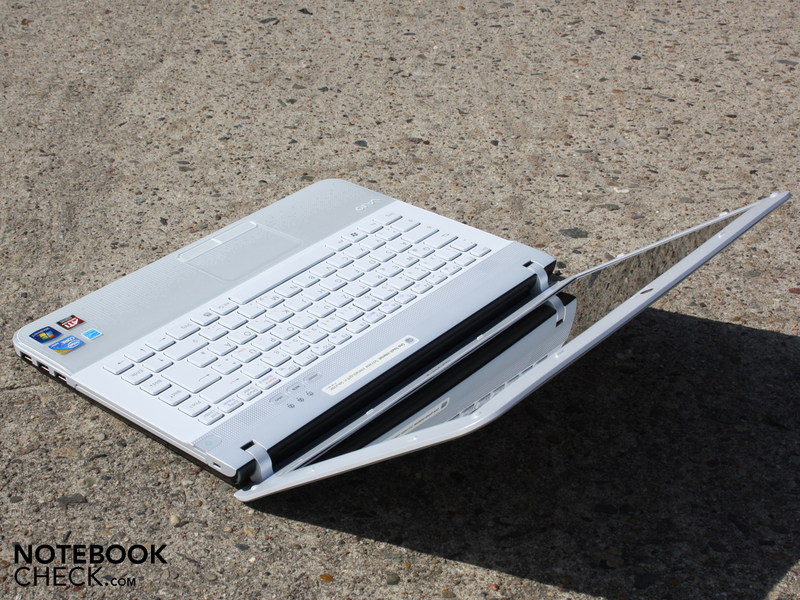 More 3D-performance at the same price: Sony Vaio VPC-CW2S1E/L. 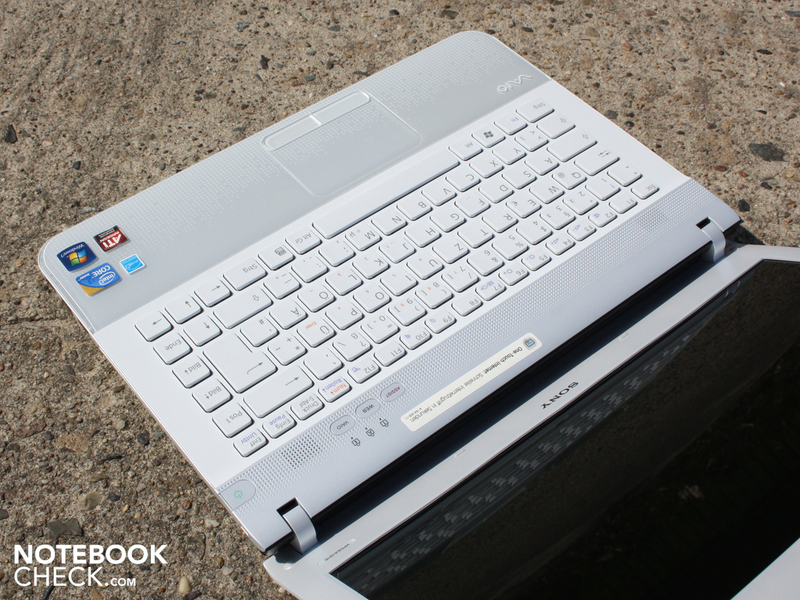 Great battery life but with a CULV-CPU, weaker performance: Acer Aspire 4810T. 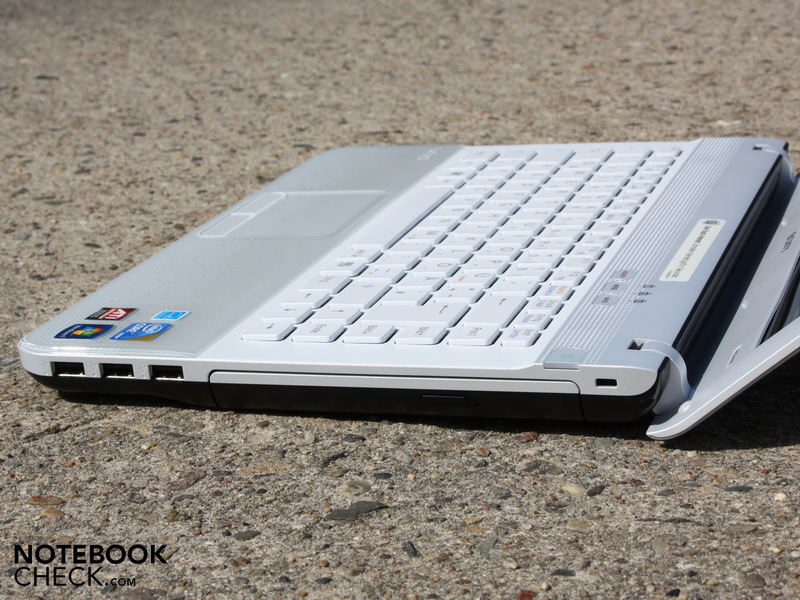 Also very pretty but made for the serious: Acer TravelMate 8471 Timeline.